A limited edition of 12018 bottles. Bottled in August 2014. In 2001, Compass Box created their first single malt blend which they called Eleuthera. It was an elegant and simple blend of approximately 80% unpeated Highland and 20% peaty Islay single malts. Alas, after 3 years, Compass Box were suddenly no longer able to obtain one of the key whiskies required for the recipe so, sadly, they retired Eleuthera in 2004. Quietly, Compass Box have always been looking for whiskies that they could use to bring it back, even if temporarily, but not with any luck. Until now. 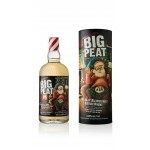 An elegantly complex union of two fruity Highland single malts and a peaty Islay single malt. An ethereal fruit and herbal character and a sweetness on the palate is buttressed by an underlying smokiness.